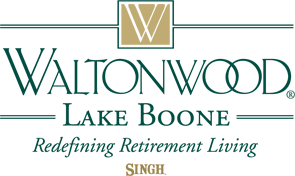 Waltonwood Lake Boone is proud to offer a luxurious and active senior living community. Our residents enjoy a worry-free lifestyle with all the care they need, and a loving staff to ensure their comfort. We encourage you to enrich your life by making new friends through interactions and activities within the community, or enjoy a meal in our restaurant-style dining room with friends and loved ones. Lake Boone residents love being a part of the Raleigh community that offers convenient access to the Crabtree Valley Mall, restaurants, entertainment, golf, Interstate 440, Raleigh-Durham International Airport, and several medical centers. Our nearby communities include Five Points, Hayes Barton, Cameron Village & North Hills, and we can provide courtesy transportation to and from many of these locations. We offer plenty of opportunities for entertainment and recreational activities within and beyond the Lake Boone community, including the House Creek Greenway Trail and PNC Arena. In addition, families are always welcome at Waltonwood, and we treasure the special bond between loved ones that a community of friends can never replace. Family members of all ages, especially grandchildren, are welcome to visit and even stay overnight in our guest suite.